Yes Jackie and I would like to see a photo of that 2.5 million $$ bus that we paid for!! What a sham. And so, while 14 million Americans are unemployed — while the national debt is at an unprecedented 14.6 trillion dollars and climbing — while his approval rating has fallen below 40% — and while 73% of Americans are telling him to TURN THE BUS AROUND, President Obama isn’t going to listen. Because you see, the President doesn’t have a plan on how to bring this country back from the brink of economic disaster. What the President does have, and all he’s been listening to, is a navigation system: Harry Reid, Nancy Pelosi, and the rest of the Democrat elite in Washington telling him where and when to turn. And unless we are able to stop them, they are going to direct the President, and the over 300 million Americans forced along for the ride, off a cliff. 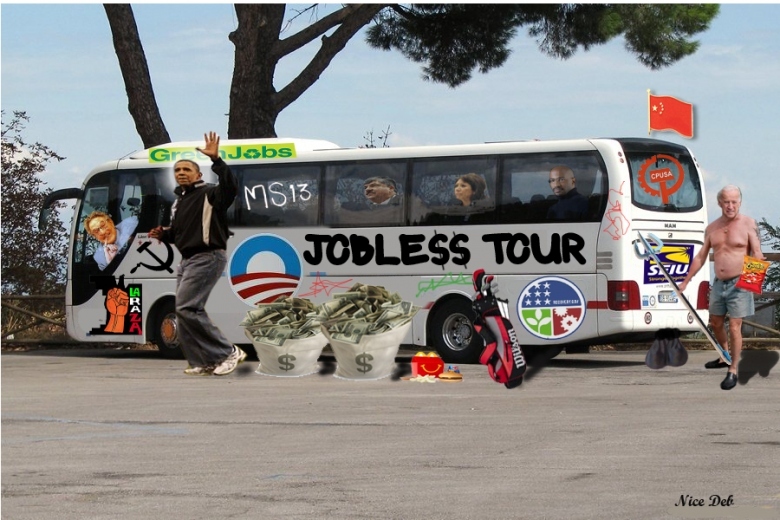 Bill - did you see that they spent $1.1 million to buy a new bus for Obama's 'non-campaign' tour through the Midwest? Maggie, No - missed the figure but knowing the Gov't, expect the would purchase an armored bus. @Maggie they bought two one will be for the eventual GOP candidate as well. ‎Sonny Black - why is the government purchasing a bus for the GOP candidate? Or any candidate for that matter? Have they done this before? Does this count as a campaign contribution then? It's a national security issue the leased buses they used b4 didnt have bullet proof body these one do. This is government purchase not a campaign donation.